. 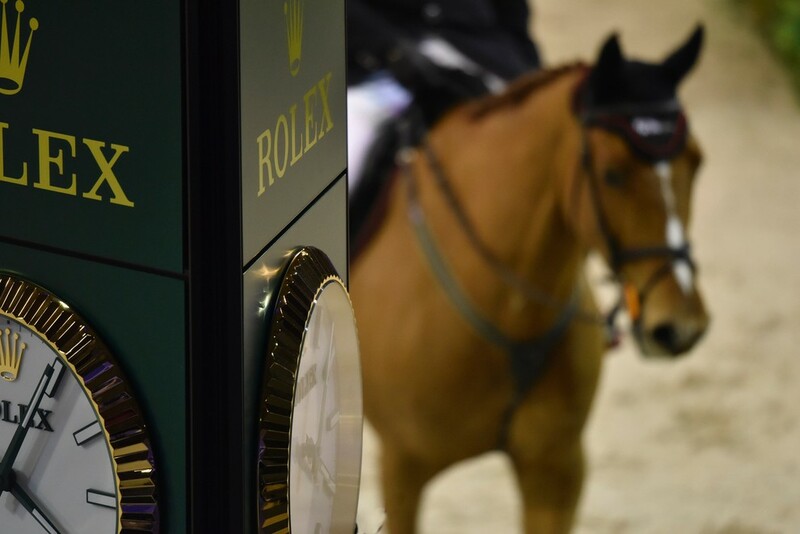 :: ROLEX CELEBRATES ITS 60TH ANNIVERSARY IN EQUESTRIAN SPORT AS THE ROLEX GRAND PRIX TAKES CENTRE STAGE AT INDOOR BRABANT ::. 2 March 2017-Hertogenbosch, The Netherlands – The eyes of the equestrian world will focus on the medieval Dutch city of -Hertogenbosch from Thursday 9 March for four days of world-class equestrian sport, culminating with the Rolex Grand Prix on 12 March. The highest-ranking show jumpers will take centre stage, featuring precision, determination and an inspiring synergy between horse & rider. Hosting show jumping and dressage, Indoor Brabant provides the ideal backdrop for this world-class competition, thanks to its state of the art facilities and professional organization. First established in 1967, Indoor Brabant is celebrating its 50th edition this year, a testimony to its remarkable commitment to world-class sport. Its long-term partnership with Rolex, which was extended in 2014, augmented its position as one of the most prestigious indoor shows on the global show jumping calendar. The year 2017 also marks the 60th anniversary of Rolex’s support of equestrianism. In 1957 the British rider Pat Smythe became Rolex’s first equestrian Testimonee, and this extraordinary athlete laid the foundations for the brand’s 60-year association with the world’s finest competitions and riders - a true testament to Rolex’s longevity and dedication to the sport. Having been welcomed into the Rolex family in July 2016, the most successful Dutch rider of his generation, Jeroen Dubbeldam will compete at Indoor Brabant, his home show, as a Rolex Testimonee for the first time. Jeroen is only the second show jumper in history to win the individual Olympic, World and European titles and was part of the gold medal winning Dutch team at the World Championships in 2006 and 2014. Having won two of the most prestigious Grand Prix’s in the world, CHIO Aachen and CSIO Spruce Meadows, he will be eager to add the Rolex Grand Prix at Indoor Brabant to his list of achievements. “Indoor Brabant is always a highlight of my competition year, and jumping in front of my home fans creates an incredible atmosphere. It gives me an added incentive to win the Rolex Grand Prix to pay them back for all the support they have given me over the years”, Jeroen said. With 13 of the world’s top 20 riders competing at Indoor Brabant, the competition will be intense, requiring perfect unison from horse and rider in order to claim the ultimate prize and cement their place in history. Indoor Brabant’s exclusive place on the equestrian circuit is a result of its combination of magnificent show jumping as well as elite dressage, creating an indoor show unrivalled in equine sport. Rolex’s esteemed Testimonees have been victorious in the premier event of Indoor Brabant four times since 2003. The most recent Rolex Testimonee to triumph at the renowned Dutch show was leading French rider, Kevin Staut, who claimed the Rolex Grand Prix in 2014 riding Silvana HDC. A number of Rolex’s Testimonees are set to return to contest for the Rolex Grand Prix this year, including Kevin Staut, Switzerland’s Steve Guerdat, The Netherlands’ Jeroen Dubbeldam, and Britain’s Scott Brash, who is still the only rider in history to achieve the Rolex Grand Slam of Show Jumping. Rolex Testimonee Isabell Werth is one of the most iconic dressage riders in history and her poise and meticulous skill enabled her to win both the Grand Prix and Freestyle classes at the 2014 show. As one of the most successful riders of her generation, and beyond, the three-time world champion will be the one to beat in 2017. Leading brand of the Swiss watch industry, Rolex, headquartered in Geneva, enjoys an unrivalled reputation for quality and expertise the world over. Its Oyster and Cellini watches, all certified as Superlative Chronometers for their precision, performance and reliability, are symbols of excellence, elegance and prestige. Founded by Hans Wilsdorf in 1905, the brand pioneered the development of the wristwatch and is at the origin of numerous major watchmaking innovations, such as the Oyster, the first waterproof wristwatch, launched in 1926, and the Perpetual rotor self-winding mechanism invented in 1931. Rolex has registered over 400 patents in the course of its history. A truly integrated and independent manufacturing company, Rolex designs, develops and produces in-house all the essential components of its watches, from the casting of the gold alloys to the machining, crafting, assembly and finishing of the movement, case, dial and bracelet. Rolex is also actively involved in supporting the arts, sports, exploration, the spirit of enterprise, and the environment through a broad palette of sponsoring activities, as well as philanthropic programmes.